MADISON, N.J. – The 18th-ranked Widener University Pride came to Madison on Saturday and lived up to the hype, posting 21 first-quarter points in a 30-0 victory over the Devils at Robert T. Shields Field. The Pride (4-0, 3-0 MAC) jumped out to an early lead and rolled to the finish with a balanced attack that totaled 488 yards. FDU-Florham (0-3, 0-2 MAC) had several early drives in Widener territory but were unable to find pay dirt. The day began with trickery from the Devils, who attempted an onside kick on the opening kickoff but the Pride were wise to the foolery and pounced on the bouncing ball. Despite the first drive of the game beginning near midfield, the Pride was forced to a three-and-out by the home defense. On the Devils opening possession, junior quarterback Tyler Maurer (West Milford, N.J./West Milford) completed two passes to Malik Pressley (Sayreville, N.J./Sayreville) but a false start penalty prevented a first down. The Pride responded with a six-play, 54-yard drive that concluded with a controversial touchdown. The Pride's senior wide out Anthony Davis caught what was ruled a handoff from quarterback Seth Klein, and proceeded to hit Klein for a 12-yard strike in the corner of the end zone. The Devils argued that the handoff should have been considered a forward pass to no avail and the score stood at 7-0. After that, the Pride kicked it into full gear by taking advantage of excellent field position and matriculating into the endzone. The drive was finished off by a five-yard touchdown scamper by senior running back Couve LaFate. On the proceeding possession, the Devils assembled a promising drive that entered Widener territory after a 13-yard reverse to Pressley. However, the drive stalled and the Devils eventually turned it over on downs. Klein found sophomore Montrell Hicks-Taylor wide open on the first play of the next drive and Hicks-Taylor did the rest. 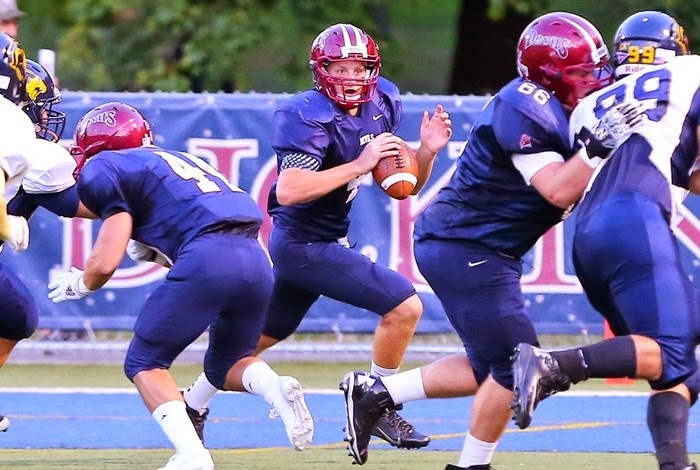 The sophomore weaved through the FDU-Florham defense en route to a 78-yard touchdown. With 4:30 remaining in the opening half and the Devils trailing 24-0, the FDU-Florham offense put together their most promising drive of the day. Maurer completed a 10-yard pass to Oscar Torres (Jersey City, N.J./Hudson Catholic) and had a 20-yard connection with freshman Tyler Adams (Port Murray, N.J./Warren Hills). From the Widener eight-yard line Maurer dropped back to pass and appeared to hit Adams for a touchdown, however,Ka'Shawn Garnes wrestled the ball out of Adams' hands for an interception. The momentum-swinging play concluded the first half and preserved the Pride's shutout. In the second half, the Devils defense did an excellent job limiting the Widener attack to just two field goals. The Pride used three quarterbacks in the game, led by Klein who finished 6-for-8 with 120 yards and the touchdown before exiting with an injury. The Pride used a cavalcade of running backs in the contest, paced by Terrant Morrison's nine-carry, 57-yard effort. Stacey Sunnerville led an impressive defensive effort by the Pride with three sacks and six total tackles. For the Devils, Maurer tossed for 143 yards on 16-of-30 passing. On the defensive side, Jaleel Tyson (Bordentown, N.J./Bordentown) made 11 stops, while Rob Savacool (New Vernon, N.J./Madison) and Troy Scales (Hamilton, N.J./Hamilton North) made nine and eight tackles respectively. FDU-Florham will be on the road the next two weeks and visit Wilkes University next Saturday with kickoff set for 1 p.m. in Wilkes-Barre, Pa.